Hello! I’m Karen, owner of The Slipcover Maker. My custom-made slipcovers and slipcover replacements are a practical solution for giving your worn & loved furniture a fresh, new look. 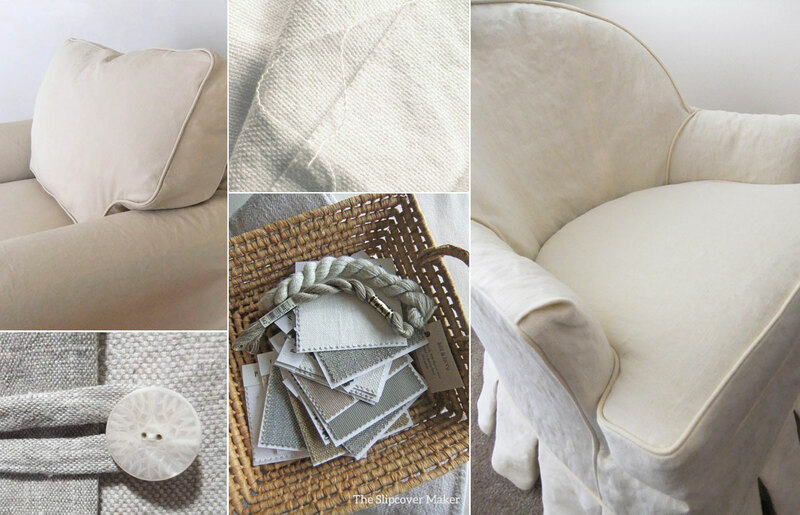 If your chair or sofa has good bones and still offers comfy-support it’s an ideal candidate for a slipcover makeover. 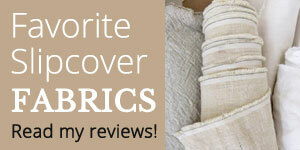 I specialize in working with washable, natural fiber fabrics to make casual, family-friendly slipcovers. Each slipcover is made by me at my workroom in Kalamazoo, Michigan. 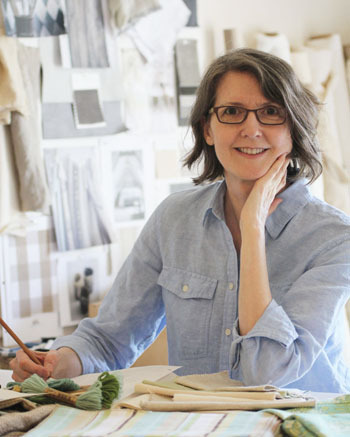 With a background in sewn product design and textile development, I bring over 30 years experience in fabric selection, pattern making and construction to your slipcover project. View my work. Slipcovermaker.com is a personal blog written and edited by me. Copyright. Unless otherwise noted, all content on this blog including text, photos, artwork and instructional PDF’s are copyrighted works that belong to me. Images may be pinned and brief excerpts from my posts may be shared on peer blogs and social media sites only if they are linked to my blog and I am given credit. No part of my content may be copied, published or reprinted without my consent. Product Reviews. This blog does not accept any form of cash advertising, sponsorship, or paid topic insertions. I do use affiliate links for some of my favorite fabrics and supplies that I frequently work with and recommend. I also accept sample yardage occasionally from select fabric suppliers to test and evaluate. I share the results via a product review as it relates to a slipcover project only if I feel it will benefit my readers. The views and opinions expressed on this blog are my own. The fabric recommendations I make are based solely on my expertise and personal experience. My fabric recommendations and product reviews don’t guarantee you will have the same experience with the fabric as I had. I’m not responsible for the actions of the fabric retailers and other suppliers I list on my blog. If you buy a product through a link on my blog, you must deal directly with that company to resolve any issues. Privacy. When you subscribe to my blog you sign-up with your email address. Your email address is not made public in order to protect your privacy. My blog only uses your email address to deliver new posts featured on my blog. I use this non-personal information combined with Google Analytics traffic reporting to better understand how visitors are using my blog. To find out more about how to manage or delete cookies please visit aboutcookies.org.